Successfully Added HD Security Camera - Indoor Usage, 1/4-Inch CMOS, Motion Detection, Night Vision, SD Recording, App Support, PTZ, WiFi Wireless to your Shopping Cart. Significantly increase your property’s security with this indoor IP camera. Thanks to its 1/4-Inch CMOS sensor, this security camera is capable of producing crisp 720p HD footage at any time of the day. It always treats you to clear and recognizable images of anybody that has entered your property. 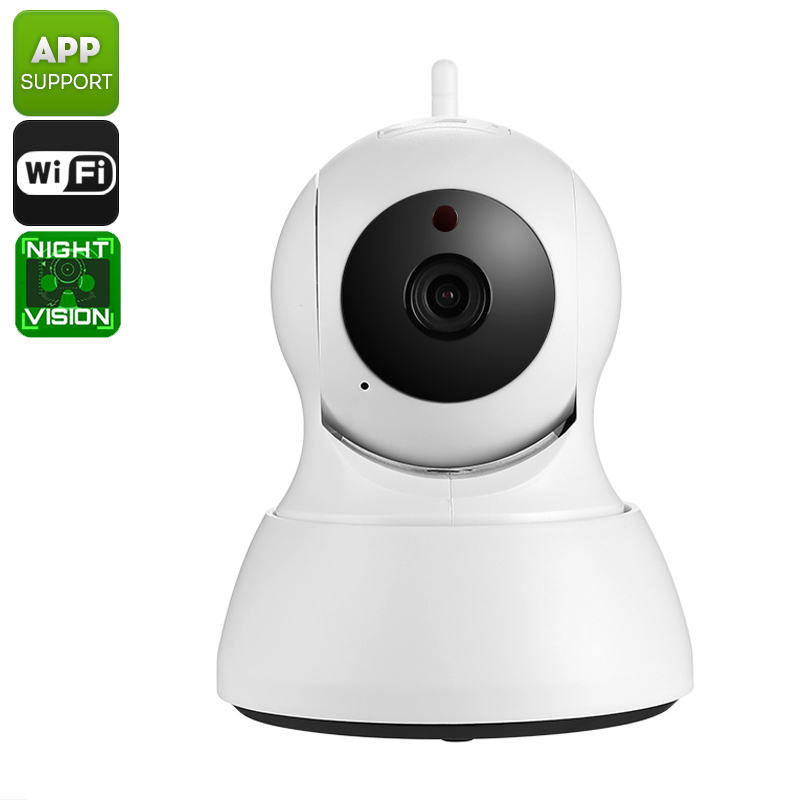 Thanks to its 10m night vision support, you can be guaranteed that this IP camera offers protection around the clock. With its motion detection and different alarm features, you can be guaranteed that nobody will ever again enter your property unseen. A built-in microphone and speaker allow you to talk with visitors and possible intruders from afar. Naturally, the microphone itself also records sound whenever movement is detected. Thanks to this, you’ll be treated to high-end audio and security footage of any unwanted visitors. This wireless IP camera is easy to install and can be accessed from afar through your PC or smartphone. The mobile Application works on both iOS and Android phones. From now on, you’ll always be up to date on your property’s security status even when you’re not physically around. All your security footage will be stored automatically on the camera’s 64GB SD card (not included). This allows you to watch back and analyze all the shot videos from your big screen PC. By supporting PTZ and a 120-degree viewing angle, you can be guaranteed that this IP camera does not leave any blind spots. From now on, even the slightest movement in your home or office will be recorded – ensuring that nobody will ever be able to enter your property unseen again. This IP Camera comes with a 12 months warranty, brought to you by the leader in electronic devices as well as wholesale security cameras..